Despite U.S. federal officials’ extensive knowledge of Scientology’s espionage activities against the government, and their awareness of Scientology’s criminal conspiracy to deprive SP class citizens of their civil rights, in the early 1990′s the U.S. decided to cease opposing the organization, and worse, to protect and promote it. It is inconceivable that this decision was made without the knowledge and agreement, or even the direction, of the U.S. intelligence community. The decision led to the Internal Revenue Service’s grant of tax exemption in 1993 to Scientology’s many corporate components as a religious organization. Subsequently, U.S. State Department and Foreign Service personnel have assisted Scientology’s efforts to operate and expand in countries whose governments viewed the organization as non-religious, dishonest or dangerous. U.S. Congressmen have introduced resolutions to condemn those countries, notably Germany, which do not embrace and support Scientology as the U.S. Federal Government does. It is apparent that since the U.S.’s strategic decision to ally Scientology, U.S. agents have improperly influenced judges and other government officials to aid the organization’s corporate components and personnel to the detriment of its victims, the SPs. It is well observed that the U.S. Federal Government and its intelligence agencies have formed a number of alliances in recent times with unsavory or criminal organizations or even dictatorships, which Scientology is, if such relationships supposedly served some U.S. national interest greater than the national interest in not being allied to such organizations or regimes. Unsavory or criminal organizations or regimes have victims, because victimizing people is what makes organizations or regimes unsavory or criminal, and the U.S. making allies of such organizations or regimes is always to the obvious detriment of their victims. What the greater national interest was in the early 1990′s, and which apparently still exists, that brought the U.S. to ally the Miscavige regime remains unclear. 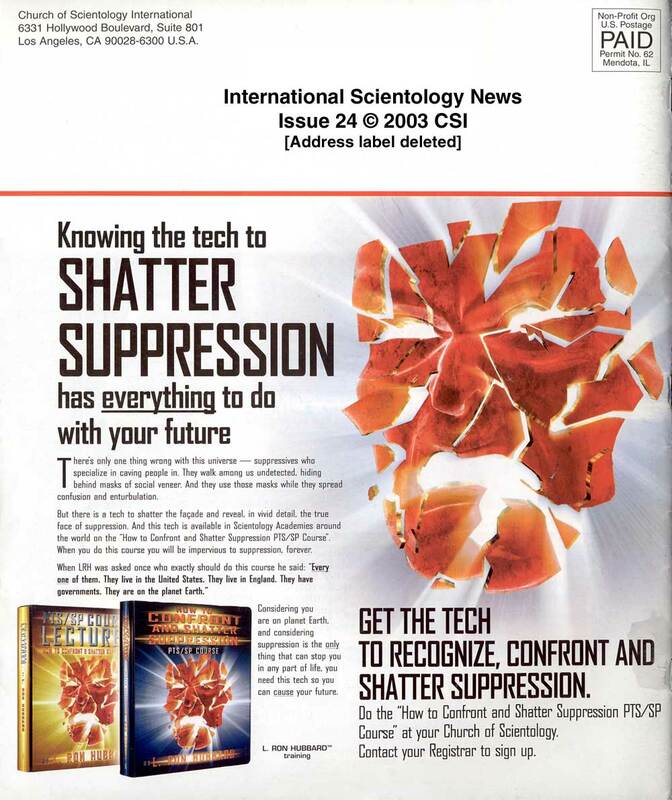 The SP class is doubly threatened and victimized because the U.S. Government and its intelligence agencies now have an interest in marginalizing and thwarting SPs in order to have the decision to support Scientology against its victims appear right and just, or in some other way in the national interest.